This DFRobot Bluetooth Bee Bluetooth wireless module adapts XBEE design. It has compact size, the pinout is compatible with XBEE which is suitable for all kinds of microcontroller systems who have 3.3V power out, the module can use the AT commands to set baud rate. The Bluetooth Bee modules comes with an on-board antenna, the antenna provides better signal quality. It acts like a transparent serial port, which works with a variety of Bluetooth adapter and Bluetooth phone. The module has been tested with all the Bluetooth adapter on the market matching to use (with the Bluetooth, including laptops and mobile phones). 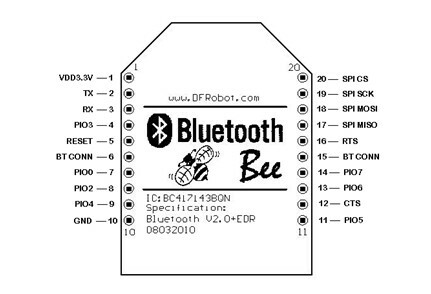 Bluetooth Bee Bluetooth wireless module can modify the baud rate to use XBEE adapter. You can use XBEE Arduino controller receives the base plug, enabling Bluetooth wireless control.